Michael Page Earns A Unanimous Decision Win Over Paul Daley After Five Rounds! A highly anticipated grudge match between an undefeated prospect Michael “Venom” Page, and the former Cage Rage British 170-pound champion Paul “Semtex” Daley is kicking off Bellator Welterweight Grand Prix tonight (Friday, February 15, 2019) inside the Mohegan Sun Arena in Uncasville, Connecticut. The referee in charge for this contest is Kevin MacDonald. Here we go! Fighters don’t touch gloves. Page keeps his hands low. It looks like a Taekwondo stance! Both fighters are very cautious! Daley runs around Page, who controls the cage well. Page throws lazy left hands. Left high kick attempt Page but Daley blocks it. The crowd starts to boo, no action. Page feints over and over. Common guys fight what are you doing?! Where is the referee?! Daley keeps circling. A great side kick to the body from Michael Page. Page controls the Octagon well but no action!!! The crowd is getting frustrated! Page tries a right front kick. A right low kick missed by Daley. It seems Page is looking for the fight but Daley keeps circling. The front punch landed by Michael Page. A great side kick to the thigh landed by Michael Page, who finishes the round with a flying knee attempt. 10-9 Page. Page feints and starts aggressively. Daley modifies his guard. A right low kick missed by Daley. Page throws left hand. Daley tries to jab Page but misses. Amazing switch kick to the face by Michael Page! Michael Page clowns, this is getting entertaining now! Daley tries to take him down but Page escapes. Daley goes forward, fighters in the clinch, finally some action. Daley keeps Page against the cage, Daley keeps left underhook, and lands a good knee! Page doesn’t like clinch, he is a longer guy here. Daley pushes Page against the cage. Page defends and escapes the clinch. A great takedown by Paul Daley, now Page is against the cage, goes for a guillotine choke attempt. No success, Daley keeps the position. Daley locked Page’s legs, this is an interesting position. And now Daley delivers punches to the body. Big right hand to the head by Paul Daley, and an elbow! Right slashing elbow hits Venom’s face again! Page got up, but eats a big left punch and losses balance!!! Daley wants blood, he continues to attack. The end of the round, 10-9 Daley, maybe even 10-8. Page is warned now, a good left low kick. Page misses with a head kick. Left jab Page, and a flying knee attempt, Daley escapes. Page misses with a right uppercut. Again great jab by Michael Page. Wow, what a right hand by Michael Page, but his rival survives, “Semtex” is so tough. Daley tries to take his opponent down, Page defends and lands few punches. Now Page is pressed against the fence. Page did a great reversal, and misses with a big knee. What a takedown by Paul Daley who ends up in the half-guard! Page defends well. Page tried to go for a triangle, Daley escapes and ends up on rival’s right side. Daley still dominates. Now Daley is in the full guard. “Semtex” controls “Venom” on the ground. ”Page’ is pressed against the cage. Page gets up, but he is still in a bad position. ‘Page’ uses right under-hook to rotate Daley. Now Paul is against the cage. Very close round! Michael Page goes to the fourth round for the first time in his life. A big right hand by Michael Page. Good jab by Page. Amazing punch to the body Page, Daley misses. An excellent right hook by Page, Daley goes for a takedown, Page sprawls but he can’t defend. Daley ends up on the top of him. Good elbow. Michael Page is on his back, lands left elbows from the bottom. A punch to the body Daley. Daley tries to go to the side control, Page blocks him with his right leg. Page got up, Daley went for a takedown, but Page lands a brutal high kick. What a left flying knee by Michael Page, followed by a right hand! And again Page lands a knee!!! It looks like Daley is rocked! Daley is on the cage again, now Michael Page takes him down! Page has a dominant position, his hands are longer. Great left hand by Page, and now he lands an elbow! Daley grabbed Page’s left arm, he defends well. Page remains on the top, controlling the position. Very close round, I’d say 10-9 Page! Daley misses with a head punch but takes Page down early on. Now Daley stands above Page, who defends with up-kicks. Daley ends up in the full guard again. Page goes for a triangle but Daley escapes well. It seems Daley can’t land any successful strike, his hands are significantly shorter. 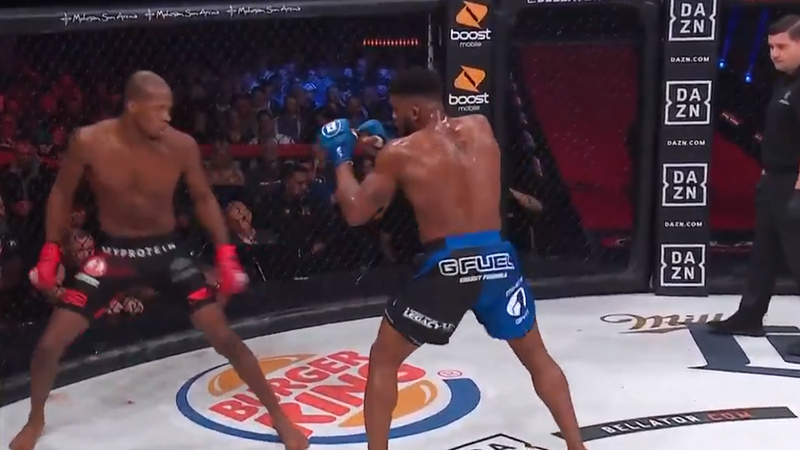 Wow, a great hammer-fist by Paul Daley. ‘Page’ is now pressed against the cage. Michael Page gets up, Daley persistently tries to take his opponent down. Great reversal by Michael Page, who ends up on the back of Paul Daley. Page landing big strikes! Daley has to risk, Page won’t let him go! Great elbows by Michael Page! Daley gets up. Page presses him against the fence. Now Daley makes a good reversal, takedown attempt by Daley, but he ends up on his back. ‘Page’ is in the top position. Michael lands a few good punches. The end of the round, this was a close one! Michael Page improves his score to 14-0 MMA, 10-0 BMMA, Paul Daley drops to 40-17-2 MMA, 5-4 BMMA.